Free Printable Star Trek Word Search Puzzle. 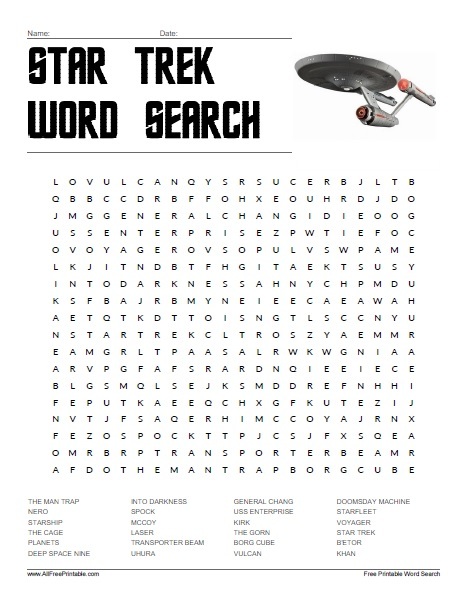 Free Printable Word Search of Star Trek series, movies, comics and animated series. Before you see the next Star Trek Beyond movie have fun finding all you favorite characters and words related to this great science fiction series. Share it with all the Star Trek or science fiction, 70s, 80s fans and friends. Find names, episodes, movies, villains and characters from Star Trek like Kirk, Spock, USS Enterprise, Planets, Khan, Vulcan, Uhura, The Cage, General Chang, Doomsday Machine, Starship, Voyager, Into the Darkness, Transporter Beam and many more. The word search includes 24 words from the movies and the answers on page 2. Star Trek Word Search Puzzle is ready to print in PDF format.